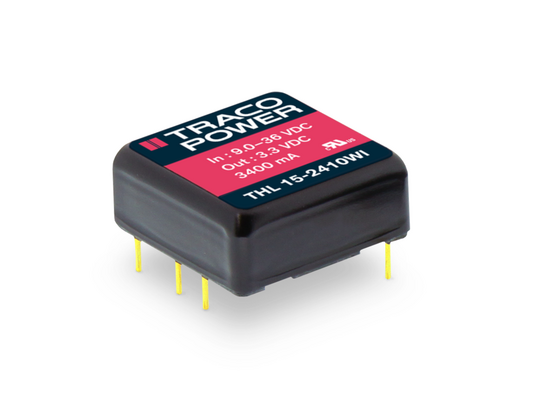 The THL 15WI series is Traco Power’s latest addition to the existing 15 Watt DC/DC converter range. With the focus on combining cost efficiency and quality this isolated high performance 15 Watt DC/DC converter is suitable for many different applications. The series comes in an encapsulated, shielded 1” x 1” x 0.4” metal package and has a fully integrated EN 55032 class A filter. High efficiency up to 91% enables the converter to operate from -40°C to +70°C without derating. All models have an ultra wide 4:1 input voltage range and precisely regulated, isolated outputs. The series meets the latest IT safety certifications (UL 62368-1) and is thus eligible for uses in mobile equipment, instrumentation, distributed power architectures in communication and industrial electronics and everywhere where cost efficiency and quality are critical factors.